If you’re not a transcription specialist, handing your audio and video files over to an online transcription provider will save you time, money, delays and grief. As with any good specialist, online transcription services providers know the most efficient ways to complete your work, and they have the in-house experience and knowledge to ensure top quality. Saving money is a primary reason for outsourcing your work to an online transcription services provider. Simply put, asking your in-house staff, who likely have salaries and benefits, to spend hours transcribing audio will cost you more than outsourcing the work. And the quality won’t be better; in fact, it could be worse. Transcribe.com, for example, employs advanced crowdsourcing techniques that leverage the abilities of professional transcriptionists with right software and hardware on an as-needed basis, ensuring savings for customers. Online transcription service providers have developed ways to streamline an otherwise tedious process and have internal project managers that lift the burden of oversight from your shoulders. Transcribe.com offers same-day and one-day turnarounds for work that might take your internal staff a couple of days or more, since they’ll need to fit transcribing in around their other duties. There’s nothing worse than worrying about a deadline for something beyond the scope of your role. If transcribing audio fits that bill, turning to an online transcription services provider is a cost effective and smart decision. Imagine being able to just hand off audio and video files to a trusted provider and picking up your completed transcriptions the same day. No hassle involved. 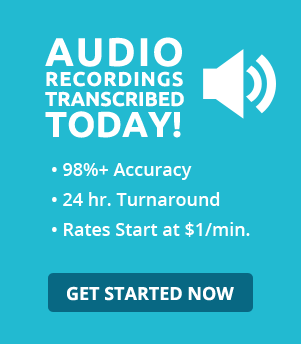 And thanks to Transcribe.com’s custom quality assurance measures that scale, you can be sure your transcriptions will be 98 percent accurate or better regardless of whether you’ve ordered 30 minutes’ worth or 30 hours’ worth.